Nagpur: Orange City is set for a new look with some of its prime properties getting ready for re-development. The vintage edifices of the yesteryears would now pave way for state-of-the-art structures. Nagpur’s old constructions – Cotton Market, Santra & Khowa Market, Gol Bazar and Netaji Market would be soon be redeveloped. A Memorandum-of-Understanding (MoU) to that effect was signed between Maha Metro Nagpur and Nagpur Municipal Corporation (NMC) at Town Hall, Mahal, today. The MoU was signed by Maha Metro MD Dr Brijesh Dixit and Municipal Commissioner Shri Abhijeet Bangar in presence of Union Transport Minister Shri Nitin Gadkari and City Mayor Smt Nanda Jichkar. City MLAs, Krishna Khopde, DR Milind Mane, Vikas Kumbhare, NG Ganar, president of Small Scale Industries Corporation Sandip Joshi of the city were present during signing of MoU. 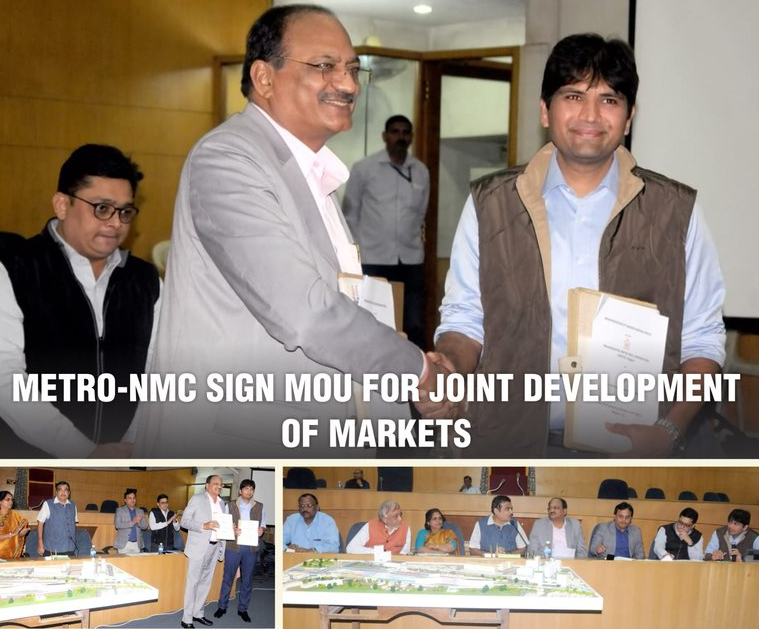 As per MoU signed, NMC will hand over land to Metro well in time for joint development of project. As per the joint development initiative, land will belong to NMC and development will be done by Maha Metro. With work on Nagpur Metro Project going on a rapid pace, Metro is contributing substantially towards city’s development. And property development at these three prime locations will boost economic development and promote employment opportunities, besides change skyline of the city.